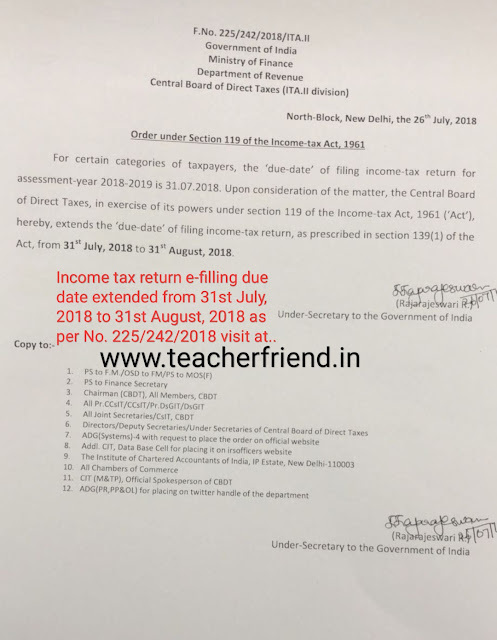 Income tax return e-filling due date extended from 31st July, 2018 to 31st August, 2018 as per No. 225/242/2018/Income tax return e-filling due date extended 31st August 2018. Income tax return e-filling due date extended from 31st July, 2018 to 31st August, 2018 as per No. 225/242/2018. Upon consideration of the matter, the Central Board of Direct Taxes, in exercise of its powers under section 119 of the Income-tax Act, 1961 ('Act'), hereby, extends the 'due-date' of filing income-tax return, as prescribed in section 139(1) of the Act, from 31st July, 2018 to 31st August, 2018.